When you hear the word “peace,” what comes to mind? Do you think of another era marked by flowers and peace signs? Or war-torn areas of the world that repeatedly make and break peace treaties with their neighbors? The good news is that there’s a new (revolutionary even!) definition of peace emerging. One that’s not just about ending wars, but actually making your daily life better. It’s about starting in your heart and relationships and creating a positive ripple through your community and far beyond. This new peace movement embraces deep spiritual practices as well as grounded, practical actions… and it’s spreading! Innovative peace building solutions are taking hold across the world — thanks to visionaries who are engaging in global social and political movements and everyday citizens performing great acts of compassion in their homes and communities. Some of the wisest, most inspiring leaders and passionate activists from all over the world are not only part of it, but guiding the way forward — from The Dalai Lama to Archbishop Desmond Tutu to Jody Williams to Jane Goodall… and more. 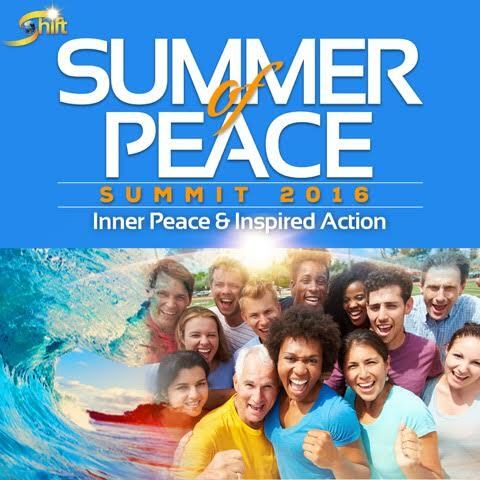 Now, you can join these esteemed thought leaders and trailblazing agents for change during Summer of Peace. During this one-of-a-kind gathering, you’ll discover the latest knowledge, science, insights and practices for peace as well as the inspiration and guidance you need to meet conflict with compassion. This series features 50+ of the world’s leading peacebuilders — including Jane Goodall, Neale Donald Walsch, Sharon Salzberg, Ocean Robbins, Audri Scott Williams, Azim Khamisa and so many more — sharing wisdom for co-creating a new peace narrative and effective methods for putting this vision into inspired action. PLUS — this year’s Summer of Peace will include recorded peace teachings from 5 Nobel Peace Laureates, including The Dalai Lama, Desmond Tutu, Shirin Ebadi, Rigoberta Menchú Tum and Jody Williams. I hope you’ll participate in this extraordinary FREE online event presented by The Shift Network. Join tens of thousands of other global citizens who are excited to co-create a more peaceful life and accelerate this wave of peacebuilding. Together we can create a legacy of good for generations to come.